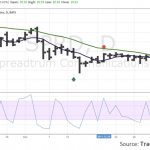 Do You Trade With Moving Averages? Securities that rise or fall multiple days in a row tend to reverse a high percentage of the time (oftentimes over 80% of the time). Connors Research, the research arm of The Connors Group is rolling out another tool for high probability trading: The Machine, a breakthrough trading and portfolio-building solution. Learn more about The Machine and what it can do for your trading.